OpenBCI stands for Brain Computer Interface, and it’s the first EEG platform commercially available that gives users access to brainwave raw data, without proprietary algorithms or signal tampering. This board is a new programmable EEG (electroencephalography) system that is completely open source. It uses the ADS1299 chip by Texas Instruments, an 8-channel, low-noise, 24-bit analog-to-digital converter designed specifically for measuring teeny-tiny electrical brain signals. It has the capability to read 8 channels simultaneously with a daisy-chain option to give users 16 EEG channels. 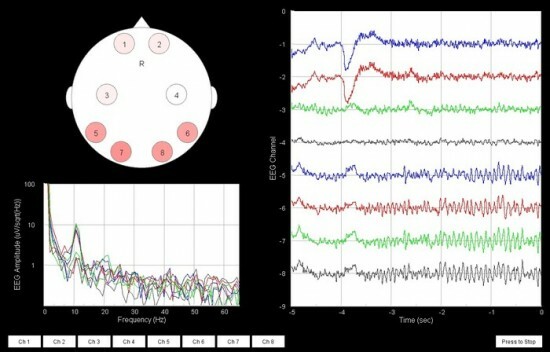 Considering that the MindFlex has only one and Emotive 5 channels, OpenBCI is the best option for brainwave data available to creative technologists, hobbyists, and research institutions alike. 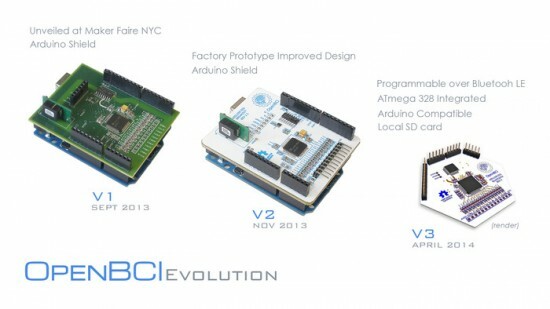 Versions I and II are Arduino shields, but the new boards have an ATmega328p on board that is programmable over Bluetooth LE. The possibilities for this technology are endless, outsourcing EEG data might help neurologists better understand the brain while walking down the street, or eating an ice-cream, things that were previously impossible to be measured in a neuroscience lab. Interaction Design is dawning upon a new challenge, to create systems that can adapt to our cognitive behavior. Brain plasticity and AI will take over our buttons and digits. It’s already happening in the field of prosthetics, it’s only a matter of R&D before we see our lives being easily controlled by merely thinking. This is an image of my brainwaves, you can see on the rightmost graph that there is a slight dip on channels 1 and 2 just over the 4 second mark. This undulation is a blink. As you can see throughout the rest of the channels there is a pattern emerging in the waves. My eyes are completely closed, this pattern is the activity in the occipital lobe where the visual cortex lays. On the left graph, you can see a peak at the 10 Hz. mark, these are the Alpha waves which are between 8-13 Hz. These waves are most prominent when your eyes are closed, and they inhibit the areas of the cortex that are not in use, while playing an important part in communication and coordination.